장수하늘소는 딱정벌레 종류의 곤충 중에서 가장 크며 중국 만주 동북부, 시베리아 우수리 지방 및 우리나라 경기도 광릉지역 등에 분포하고 있다. 장수하늘소의 몸길이는 수컷 12㎝, 암컷 7∼8㎝ 정도이다. 몸은 검정색 또는 흑갈색을 띠며, 광택이 강하고 등에는 황갈색의 잔털이 빽빽하게 나 있다. 겉날개는 적갈색이다. 가위처럼 크게 발달한 큰 턱은 윗쪽을 향하여 구부러져 있고, 양옆에 이빨 돌기가 1개씩 바깥으로 나 있다. 더듬이는 몸길이보다 약간 짧으며, 앞쪽 끝으로 갈수록 마디가 가늘다. 앞가슴 등판에는 노란색 털뭉치들이 여덟 팔(八)자모양의 무늬를 이루고 있으며, 옆가장자리에는 톱니같은 돌기가 있다. 서어나무, 신갈나무, 물푸레나무 등 오래되고 커다란 나무들이 자라는 숲에서 서식한다. 암컷이 나무줄기에 구멍을 뚫고 알을 낳으면, 애벌레는 단단한 나무의 섬유로 이루어진 부분을 파 먹으며 생활한다. 다 자란 것은 줄기의 혹같이 나온 부분에서 나무진을 빨아먹으면서 생활하며 6∼9월에 나타난다. 한나무에 2∼3마리 또는 3∼4마리가 산다. 장수하늘소는 그 원시적인 형태로 보아 하늘소 종류 중에서 가장 오래 전에 지구상에 나타난 것으로 보이며, 아주 비슷한 곤충이 중남미에 살고 있어 지난날 아시아와 그 대륙이 육지로 이어져 있었음을 증명하는 살아있는 자료로서 생물 분류 및 분포학적 가치가 큰 진귀한 곤충이므로 천연기념물로 지정·보호하고 있다. The longhorned beetle is covered with a hard shell and is the largest among insects. 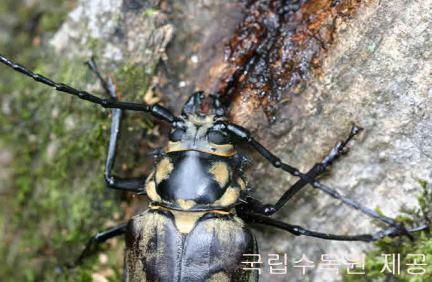 The beetle is found in Northeast China, Siberia, and Gwangreung of Korea. The male is about 12cm long, and the female is approximately 7-8cm long. It is glossy black or dark brown, with yellow-brown fur on its back. Outermost wings are red brown. Its big chin is shaped like scissors and is crooked toward the upper part. Each side of the chin has a promontory. Its antennae are thin and shorter than its body. A tuft of yellow fur on the upper back seems to be a pattern like an "eight" in Chinese characters. 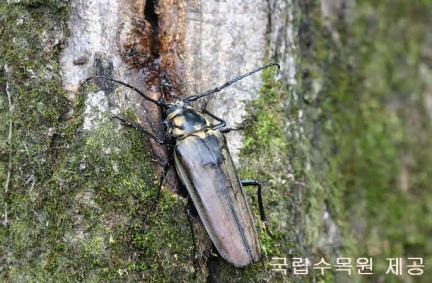 The longhorned beetle lives in forests where Carpinus laxiflora, Quercus mongolica, and Fraxinus rhynchophylla grow. An adult female makes a hole on the trunk of a tree when she lays an egg. The larva lives on fibers in the tree. Adults eat resin, and they are found during June and September. Longhorned beetles inhabit a tree in groups of about 2-3 or 3-4. It lives in Central and South America. This suggests that Asia was once connected to South America. The longhorned beetle lives in a limited area and is endangered. Therefore, it is designated and protected as a natural monument.